Burns IP & Commercial is a Melbourne law firm specialising in Intellectual Property, Trademarks and Patents. Founded by Natasha Burns, Burns IP services include trademarks, patents, business documents, licensing, company set up and international trade. BURNS IP & COMMERCIAL PTY LTD IS AN INDEPENDENT INTELLECTUAL PROPERTY LAW FIRM THAT STANDS OUT FROM THE CROWD. We provide patent, trademark, design & copyright services in Australia, New Zealand, the South Pacific islands and the United States. With over 20 years of experience, you can trust our team to provide the highest level of legal and corporate advice. Through our established network of alliances, we can protect your IP throughout the world. We can help you with strategic IP decisions in the context of your business. With a team of experienced trademark and patent attorneys, chartered accountants and paralegals, we bring together our expertise to make sure you make the most from your innovation and investment decisions. We can assist you in the set-up and structure of your business to protect your IP, as well as prepare your commercial contracts, service agreements, distribution and licensing arrangements to make sure you are maximising the financial value of your intellectual property. And, when you are ready, we can assist your entry into international markets. Global best practice standards, but at small firm rates. We are good at what we do. Because our team has worked at large law firms, and Fortune 500 companies, our clients benefit from a high level of technical expertise, but at small firm rates. We keep our overheads low and by using the latest technologies, we outshine our competitors by providing the best technical legal advice, in a responsive time-frame and, at a reasonable price. Voted “Best Small Law” firm by our clients. Our clients enjoy working with us. And we enjoy working with our clients. We are one of the few independent and privately-owned IP law firms in Australia. Our friendly, open and collaborative approach means that we know you, and are part of your team. This is why our clients voted us BEST SMALL LAW FIRM, Business Client Services, National Finalist and Runner-up for Victoria/Tasmania. Many businesses and government organisations pledge to purchase a proportion of their services from suppliers that are women-owned. We are one such supplier and meet women-owned business guidelines to achieve diversity supplier requirements. We are wholly committed to diversity practices and policies, particularly those that benefit professional women in the workplace. Our progressive culture and work arrangements mean that we can attract and retain top-skilled professionals including lawyers, corporate advisors, patent attorneys and paralegals. This is one of the reasons we were a national finalist for “Boutique Diversity Law Firm of the Year”. Some of Australia and New Zealand's most recognised brands entrust their trademark portfolios to us. Why? 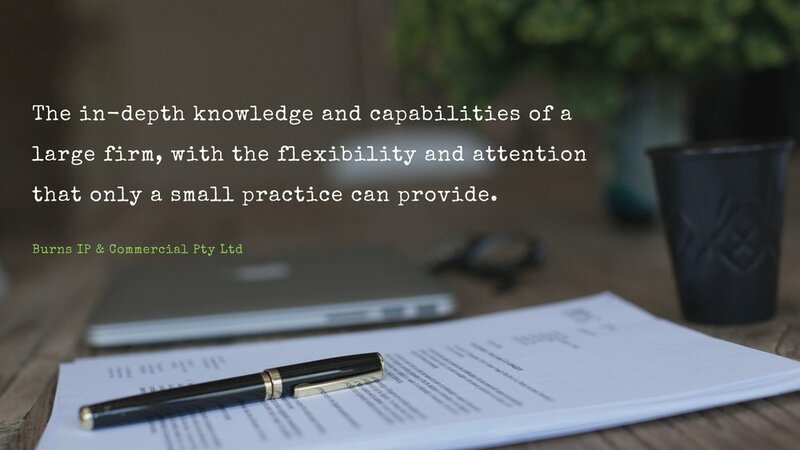 Because we provide global best practice standards, at small firm rates. Our patent practice covers a diverse range of industries including machine tools, 3D printers, medical devices, household items, communication products and software. We know how to prepare your key business documents to formalise your business arrangements, protect your IP and set out performance targets. An IP license agreement may be one of your business’s most important commercial documents. Let us help you maximise the revenue potential of your IP. We take care of the red tape for you. Our simple checklists and corporate document "bundles" mean that you can have your company set up in minutes and be ready to start business. Ready to enter an international market? We are licensed to practise in Australia, New Zealand, the United States and International Trademark and Patent Registers. Burns IP operates with a small number of highly-skilled staff. Use the form below to contact us if you would like more information about out services, or to get in touch with one of our team.